A copy of your statement of purpose or letter of application. It is fine if it is only a draft--I can give you feedback. But I need to know what you are applying for, and your statement of your reasons why. A copy of your most recent UCSB transcript, *unofficial is fine* (print it out from GOLD). I need to be able to comment on your academic credentials all around. This will also remind me which courses of mine you took, and what your grade was. Originals or copies of any work you submitted for the course(s) you took with me. (I will return them.) Going back over these will refresh my memory and enable me to be much more specific in the letter I write, thereby making it carry more weight. Scans with any comments I wrote on them are most valuable. 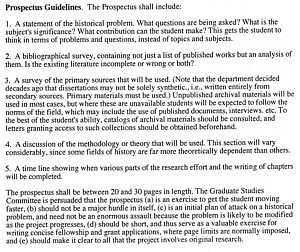 For applications to graduate schools that require a writing sample: show me the sample when you drop off your materials. I may be able to give you advice, and it will help me to tailor my letter to your unique profile. Send your advisers/mentors a list of places (jobs/funding organizations) you are applying to with descriptions of the job/grant, and most importantly, deadlines. (Is the job in modern Europe or Russian history? Do they expect you to teach Western civ or world history? Do not just give us the websites of the job you are applying, since it is extremely time-consuming for us to check each website to find out when the deadline is). Coming to visit and meet me & others? Get directions from my HSSBLocation page. My current graduate students used to be listed at the end of the left column on my Department Faculty page--but since site update in Sept. 2015 that feature has not yet been restored. Check my faculty homepage on the new site to be sure. 1998 AHA Perspectives article "The Trials and Tribulations of Applying to Graduate School"
1999 AHA Perspectives article "Guides to Graduate School and Beyond"
Braintrack.com has a page of scholarship advice and annotated search links as well. Calculator for federal Expected Family Contribution, from finaid.org. 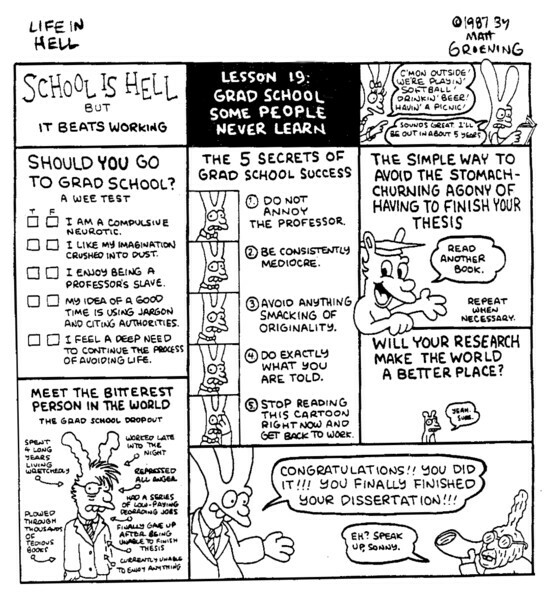 Should you enroll in graduate school? As the cartoon in the page header indicates, it can be a long, difficult road with no holy grail waiting at the end. This April 2010 Inside Higher Education report "An Agenda for Graduate Education" offers information from the macro perspective. Most students are great, but some you want to kill. "What Doors Does a Ph.D. in History Open?" 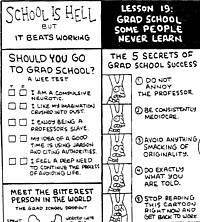 Oct. 30, 2012 Chronicle of Higher Education article about alternative (non-academic) career paths for History Ph.D's. UCSB was one of 4 departments surveyed and analyzed; the article contains a link to graphs of UCSB (and 3 other schools') placement data. Sorry, I haven't written a narrative for this section. For now, the information about my research interests on my homepage will have to do. My students at UCSB who are preparing for their dissertation qualifying exams have asked for examples of examination reading lists, questions, and prospectuses. For their use and at risk of embarrassing myself, I provide the following samples of my own from the University of Michigan in 1988. I think we had a 3-hour written exam in our main field, and a 2-hour oral exam covering all four fields. 4th field (sociology): reading list: "Capitalism and Structural Transformation"
my own disseration prospectus (version submitted to the Friedrich-Ebert-Foundation). 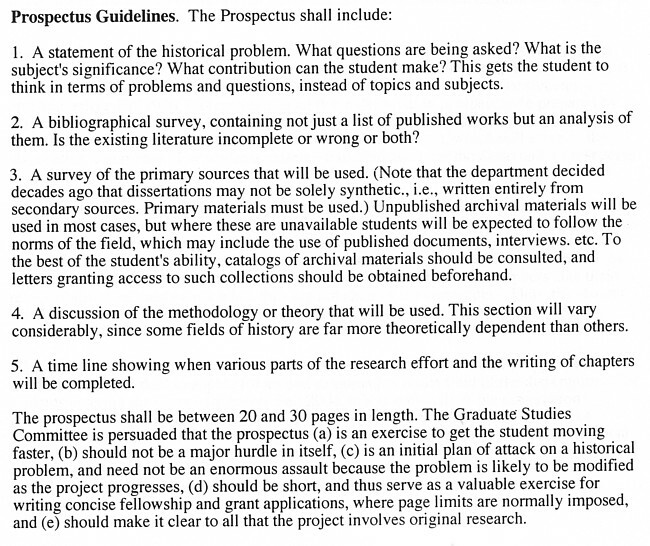 The UCSB History Department Graduate Handbook contains the above guidelines. Carleton College has very practical advice. What are we going to learn a s the result of the proposed project that we do not know now? H-German's reading lists from Oct. 2004 are divided into categories by time period. Alastair Thompson's reading lists on Wilhelmine, Weimar and Europe since 1945 (with Germany section) are excellent and comprehensive (Durham University, 2001-02)(2008 web archive version). Eagle Glassheim's 1996 Reading list Germany 1871-1949, for Prof. Atina Grossmann, then at Columbia University. James Frusetta (faculty page) posted a list of Germany comp. exam questions (dated 1988-1998) in 2007 that he had compiled (now available only on the web archive). He has a similar compilation for Central Europe. Note that my 200E is not the same course as the UCSB Hist 200E introductory reading course for all Modern Europeanists. Winter 2007: History in the Public Sphere: Analyzing "Collective Memory"
Since I haven't yet had a "critical mass" of students specializing in German history, I've offered this content in conjunction with a 200e, and as an independent reading course only. 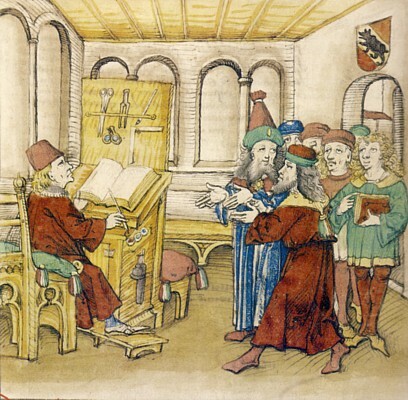 Hist 209AB: "The Academic Profession of History"
UCSB offers two courses to prepare advanced graduate students for the job market and future teaching: Hist 209A-B, "The Academic Profession of History." Reviewing books is an important skill. See this 2001 Perspectives article by Bruce Mazlish on "The Art of Reviewing." Carl-UNCOVER, merged with ingenta, a commercial document-delivery service for journal articles, in 2001. National Public Radio programs, with searchable audio archives of Morning Edition, All Things Considered, Weekend All Things Considered (search box at top right), Weekend Sat. Morning, and Sun. Morning and Radio Expeditions. Yahoo's German history links page. AICGS (Amer. Inst. of Contemp. Germ. Studies, Johns Hopkins). It has 2 fellowships (DAAD & visiting fellows). Friedrich Ebert Foundation, Bonn (SPD), offers dissertation fellowships. H-Holocaust, which has some syllabi. (see 1994 e-mail exchange about visits to Dachau). House of the History of Germany since 1945 (a museum in Bonn). (English version). US Holocaust Memorial Museum in Washington, with searchable archives of photographs and documents, and various fellowships. Mary E. Brenner, "Interviewing in Educational Research," in: Handbook of Complementary Methods in Education Research *AERA, 2006), 357-370. German Studies Depts. (listing by U. Wisconsin) Those with Ph.D. programs usually have good programs in German History as well; many of them are listed below. Berlin, Humboldt Uni (Ludolf Herbst, Gerd Dietrich). The HU hosts H-Soz-u-Kult. Harvard (Peter Gordon, Charles Maier), Center for European Studies. Minnesota (Mary Jo Maynes, Eric Weitz, Karen Till-2006); Ctr. Hol.& Gen. St. The University of Texas at Dallas (UTD) welcomes applications from exceptionally well-qualified holders of the Bachelor's or Master's degree for appointment as Belofsky Graduate Fellows in UTD's School of Arts and Humanities. Application from students pursuing the study of the Holocaust or modern Jewish culture or comparative perspectives on the American and European Jewish experience are particularly welcomed.